I just watched a documentary recounting the mysterious disappearance of ships and planes, including five US bombers on a training mission, in the Bermuda Triangle off Florida in the North Atlantic. Everything from alien abduction to sudden eruptions of methane hydrate gas have been blamed for the losses. 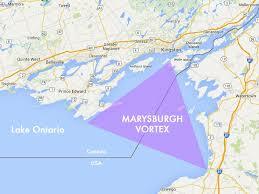 Well, we have our very own ship-devouring triangle right here in the eastern end of Lake Ontario, known as the Marysburgh Vortex. 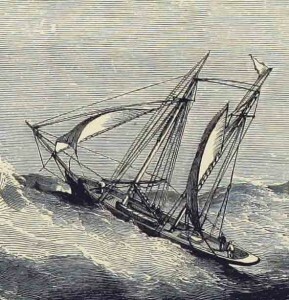 When steamboats and schooners ruled, more than two thirds of Lake Ontario shipwrecks occurred in the Vortex. Mysterious fogs arise, storms whip up with terrifying speed, magnetic anomalies send compasses awry. The region also contains Charity Shoal, a large circular crater likely from a meteor hit. Over 100 vessels have vanished into the Marysburgh Vortex. A storied local example is the schooner Picton, carrying coal from Charlotte, Rochester in the US to Belleville, Ontario. The Picton set out with two other vessels. Before their eyes, the Picton vanished from sight. Weeks later, a message in bottle later from the captain said he had tied himself to his son so they should be found together. No bodies were ever found. There is also the strange case of the Bavaria, a schooner found seaworthy, intact and undisturbed, but with the crew completely vanished. No trace of them was ever found either. The Marysburgh Vortex has been studied extensively by both the US and Canadian governments, investigating why many have come to grief. I don’t know whether they spotted any extraterrestrials at work. For all those who love marine mysteries, and who want to be forewarned when sailing into the smiling waters that contain such hidden danger, here are a couple of sites with some fascinating reading. Next Next post: Thanksgiving Ahead. Start the Turkey Now.